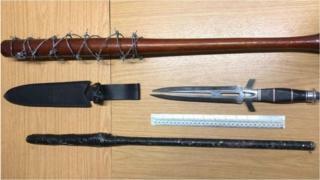 Weapons including a barbed wire covered baseball bat like that seen on cult TV programme The Walking Dead have been found in an abandoned car. The car was found by police in South Ockendon, Essex, after its driver had earlier failed to stop for officers. PC Paul Glensman said "some nasty items" were found including the bat similar to 'Lucille' - carried by Negan, played by Jeffrey Dean Morgan. Responding to PC Glensman, the actor tweeted that he was in the US. In the TV series, villain Negan uses the baseball bat to terrorise human survivors of an apocalypse who fight gangs of zombies. The character revealed in the seventh season of the US show that his ever-present bat was named after his dead wife. The long-running post-apocalyptic drama, which airs on Fox TV in the UK, is based on a comic book series written by Robert Kirkman. PC Glensman thanked the actor for the information about his location and said he would be eliminated from inquiries.